Herefordshire is in the heart of mistletoe country, but it really only comes into its own in the winter when all the leaves have dropped from the trees that host them. They are so ubiquitous in the county that I swear they even grow on telegraph poles! There are over 1400 species of mistletoe in the world and all of them are semi-parasitic, that is they take water and minerals from the host tree but are green and so can photosynthesise. 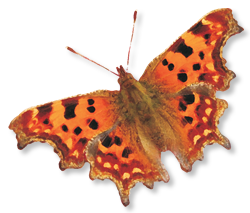 There is only one British species, Viscum album, which is most commonly found on apple trees. They have separate male and female plants, and only the females bear the familiar round white berries. The male plants tend to be more pendulous, the female more upright, but some growths appear to be a mixture of the two as they can grow very close together. There is a huge amount of folklore around mistletoe, everyone knows about kissing under the mistletoe at Christmas but this has come from very long standing beliefs way back to the Druids – and not surprisingly most are associated with fertility! Mistletoe was believed to be seriously magical as it remains green when everything else is leafless, and it appears to grow without roots way above the earth. Mistletoe was hung in Herefordshire cottages, then every year on New Years Eve a new bough was cut and hung up as the clock struck midnight, at the same time the old bough was taken down and burned. More elaborate was Burning the Bush where a globe of hawthorn and mistletoe was burnt on New Years Day in the first sown wheat field to purify and fertilise the soil. Usually this ended in “cider-drinking and general carousing”!! In the Middle Ages mistletoe was used for a range of maladies and reasons, from breaking of epileptic trances and dispelling tumours, to divining treasure and keeping witches at bay! Lindow Man, preserved in peat since the 1st century AD had traces of mistletoe in his stomach, possibly as part of a herbal remedy (which presumably didn’t work!). Today we know that mistletoe contains some toxic chemicals, lectins, but they can be used in a controlled way, and could have an important role as an anti-cancer agent. 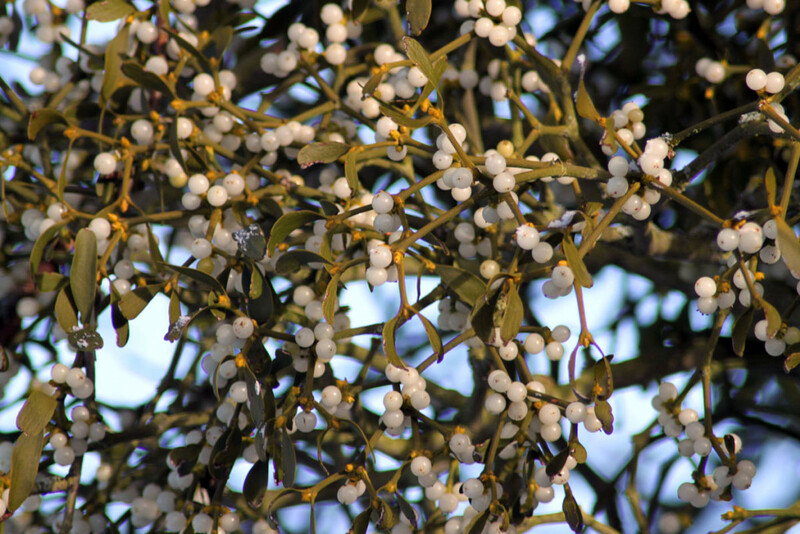 Mistletoe tea is widely available on the continent, though it is hard to obtain in the UK. Like all aspects of mistletoe, the methods of propagation have a mythology of their own. In actual fact it is quite easy to grow, all you need is sharp eyes and a great deal of patience – it grows very slowly for the first four years or so. Basically take some fresh juicy berries in February/March and squash them onto a young branch of your chosen host tree (apple, poplar, limes and hawthorns are all good). By March/April you should have tiny seedlings, and that is all they will do in year one! By year three the first proper leaves should appear and then they will grow much more rapidly, but remember you will need at least two plants to get berries!